My retro look back with an Italian classic. My retro two pack; yellow & blue stripes of the 1984 Metauro Mobili Pinarello wool jersey, with my black 1987 Columbus SL Marinoni. Today was the first time, in my recollection, that I pulled out my Metauro Mobili Pinarello wool jersey from out of the closet. The morning started out sunny only 13 degree Celsius as I contemplated using the wool jersey and leg & arm warmers. I was right. It was cool enough for wool. In fact, wool is a wonderful natural fibre, it keeps you warm in winter and comfortable when the temperatures climb. A cool breeze was blowing and the jersey kept me comfortable and I was proud to show it off. I pulled on the size four Italian jersey and it still fit well. The memories instantly came flooding back as I remember picking up this beautiful jersey at Cicli Pinarello in Treviso, Italy. Meeting the famous frame builder, Giovanni Pinarello was a very big thrill and to honor that I just had to have a team jersey. The yellow & blue stripes hooked me. That was back in 1984. Italian professional cycling team, Metauro Mobili Pinarell0 ran for three years: 1982, 1983 and 1984. 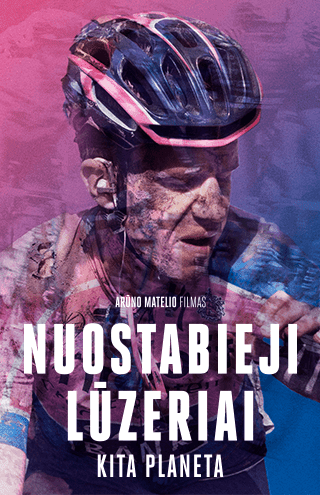 A solid cycling team with big names: Lucien Van Impe, Johan Van der Velde, Flavio Zappi, Marco Groppo ... to name a few. 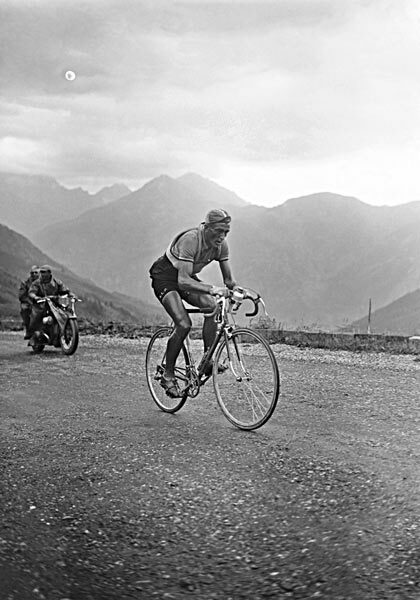 The team, of course, used Pinarello SLX steel bikes. And they competed successfully in the Tour and Giro winning their share of glory; Lucien Van Impe won twice the KOM jersey in the 1982-83 Giro. KOM jersey in the 1983 Tour. 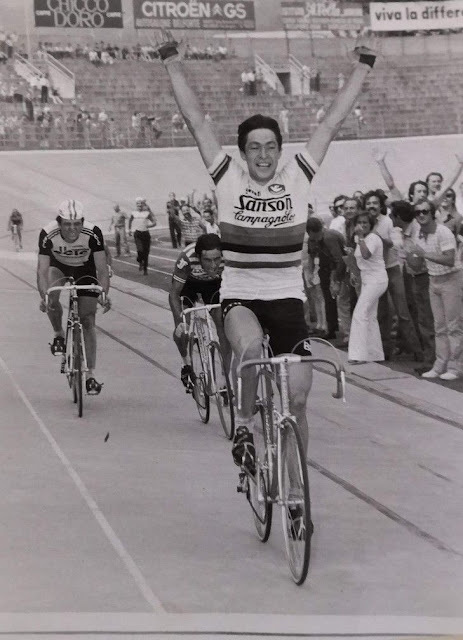 Marco Groppo won the Young Jersey classification in the 1982 Giro. A superb team it was! The classy Metauro Mobili jersey of the 1984 Giro d'Italia. 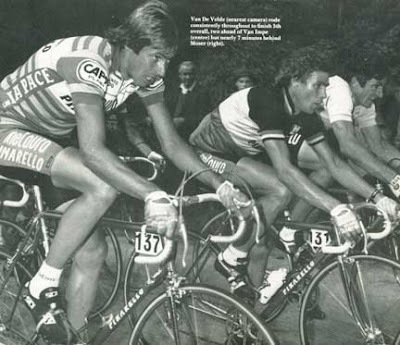 (left to right) Johan Van derVelde(5th overall) & team leader, Belgian national champion Lucien Van Impe(7th overall) on the good-looking Pinarello's beside Maglia Rosa and eventual winner, Francesco Moser. Great photo. I accidentally stumbled across your site. I just sold my '83 Pinarello on CL just 2 weeks ago to somebody in Burnaby. I'm pretty much another middle-aged x-roadie turned freerider, who happens to live on the Shore. I'm thinking of getting back into the road thing again. The pix are great. 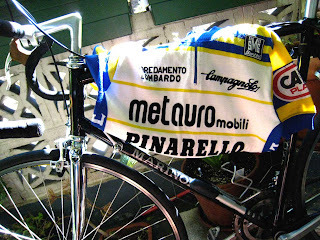 I remember my old wool Pinarello jersey. Kind or reminds me of the Pepsi ads, I have fond memories, then I remember how prickly and hot it was and I'd don't long for the past so much any more. Happy trails!